Mangaluru, May 31, 2017: The Dept of Public Health Dentistry, A.B. 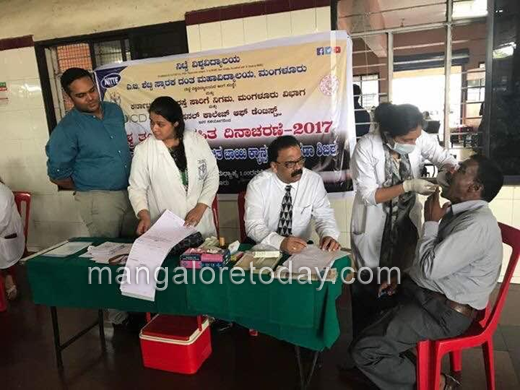 Shetty Memorial Institute of Dental Sciences (ABSMIDS) in association with Karnataka State Road Transport Corporation, Mangalore Division and International College of Dentists commemorated the World No Tobacco Day by conducting a free dental treatment and an oral cancer screening camp at KSRTC bus stand premises on May 31, Wednesday. The program was first-of-its-kind initiative. The inaugral function commenced at 11am. Priya Suvarna, Labour welfare Officer , KSRTC Mangalore Division welcomed the gathering. Vivekananda I. Hegde, Divisional Controller, K.S.R.T.C, Mangalore Division officially inaugurated the programme by lighting the lamp On the occasion. Dr Sahana Maben, Rural Health Coordinator, A.B.S.M.I.D.S. delivered the health talk describing the ill effects of tobacco. Dr. U.S. Krishna Nayak, Principal & Dean, ABSMIDS and Dr. Audrey D’Cruz, I/c Department of Public Health Dentistry graced the occasion. A street play on Tobacco and it’s ill effects was performed by interns. The music and song for the same was composed by the harmonicist B.P. Anchan. Dr. Shilpa M., Senior Lecturer, Department of Public Health Dentistry, ABSMIDS proposed the vote of thanks. The camp was conducted from 9am to 1:30pm. About 50 patients benefitted from the camp.